Istanbul travel guide. Top 10 Istanbul attractions. Plan your trip to Istanbul! The Topkapi Palace constructed between 1460 and 1478 by Sultan Mehmed II (the conqueror of Constantinople), the imperial palace of the Ottoman sultans and the most extensive and fascinating structure of Ottoman Empire with its marvelous green courtyards and interior design as the home of the sultans and with unrivalled collections of porcelains, fabrics, jewels, manuscripts, as a museum. Get your Istanbul tour guide! The Hagia Sophia, the Church of Divine Wisdom located at the European part of the city in Sultanahmet area (old town) near the Topkapi Palace. It was the center of Orthodox Christianity and served as the cathedral of Constantinople for more than 900 years until 1453 when the city was conquered by the Ottomans and became one of the imperial mosques of Sultans for 500 years. 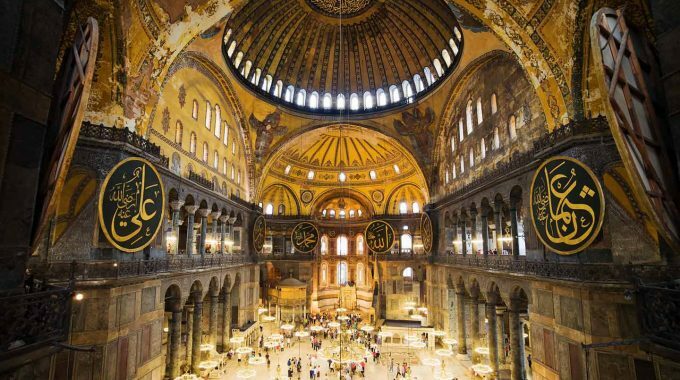 In 1935, Hagia Sophia was converted into a museum. Sultan Ahmet Camii, known as The Blue Mosque, located in Sultanahmet at the east side of ancient Hippodrome is accepted by many to be the most splendid of the imperial mosques in Istanbul with its six slender minarets and the interior design with Blue Iznik Tiles. The Basilica Cistern is the largest and most magnificent covered cistern in the city located in the west of the Hagia Sophia Square. The name of the cistern comes from a basilica that was once located nearby. The Egyptian Market (Mısır Çarşısı in Turkish), also known as the Spice Market, is Istanbul’s second bazaar constructed in the same complex as Yeni Camii (or New Mosque). The L-shaped market with six gates and the mosque was built for the mother of Mehmet IV. The Galata Tower, originally known as the Tower of Christ, was built by the Genoese in 1348 during their occupation of the area and stood above the fortification surrounding the Genoese city-state. There is a spiral rock staircase to the top viewing platform offering visitors spectacular 360 degree panorama of the entire city. The tower was restored in 1967. There is also a restaurant on the top floor. The Maiden Tower considered to be a symbol of Istanbul was established on a small island at the entrance of the Bosphorus. In the past, it was used as a watchtower and a lighthouse, until its present purpose of a tourist attraction. Some describes the Galata Tower as the Leander’s Tower who was drowned while swimming to reach his lover Hera. Some suggests that it was the tower where an emperor put her daughter for security to protect her to be bitten by a snake. 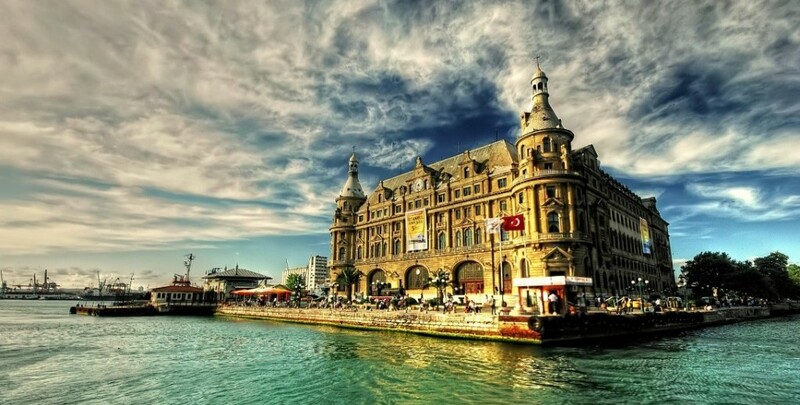 The Haydarpaşa Train in Kadikoy on the Asian Side was built in 1908 with Prussian-style architecture as the first stop along the Baghdad railway. Now it is the main station going to eastbound destinations both within Turkey, and international. Plan your Istanbul travel in 3 steps: First book the cheapest flight to Istanbul, then book the best Istanbul hotel and finally choose Istanbul tours, tickets and activities for an amazing Istanbul travel. 1. Book your flight to Istanbul! Search flights to Istanbul, get the best flight deals to Istanbul, book your flight to Istanbul online and enjoy this amazing city in your vacation! 2. Book your Istanbul hotel! Hotelscombined.com is a leading online hotel price comparison website searching hotels from all major travel websites if you are looking for the best Istanbul hotel deals. 3. Get your Istanbul tour guide! Book your Istanbul tour tickets for top attractions in & around Istanbul! GetYourGuide.com offers the best Istanbul tours, the lowest prices, fast & easy booking.